Ensuring that our talented, hard-working employees are compensated fairly and competitively is a top priority for our university. That’s why in 2016 we began an initiative to redesign our job classification and employee compensation structure, with the help of colleagues throughout the university, a top national consulting firm and university leadership. This initiative involved about 3,500 employees whose Administrative & Professional (A&P) and University Support Personnel System (USPS) positions were thoroughly evaluated over the past couple of years. Our goal is to provide more consistent job titles for similar job responsibilities across campus as well as a clearer path for employees to advance in their careers. We also aimed to establish clearer guidelines for requests for salary increases and promotions. Phase I of the study is now complete, and as a result we have updated pay grades, pay ranges and job titles. Some employees are assigned new job titles, and all employees are assigned an updated pay grade and pay range. Our attention is now fully focused on Phase II of the study, which involves increasing salaries for employees who are currently below the market minimum of their new salary grade. Interim President That Seymour, Jr. created a task force with Administration and Finance and Academic Affairs to develop a plan to fund the salary adjustments. 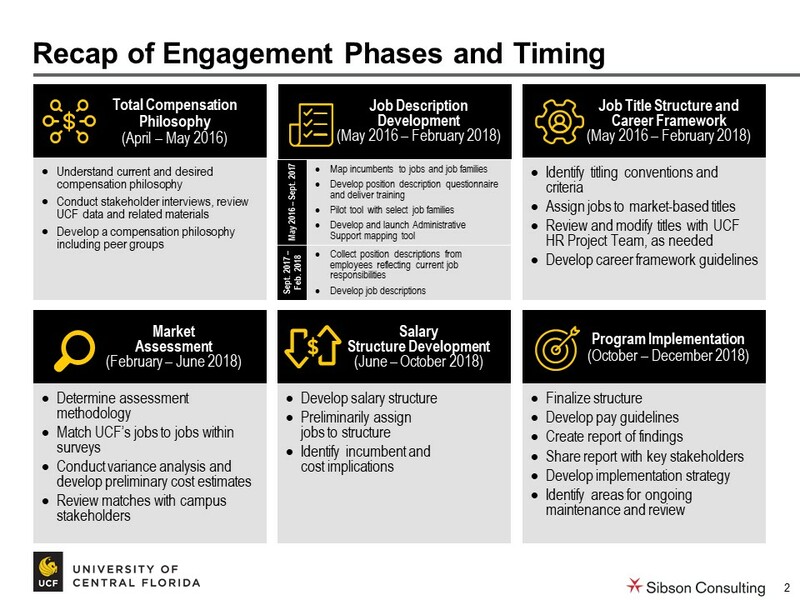 The first phase of this plan, if approved by the UCF Board of Trustees at its meeting on May 16, 2019, would fund salary increases for eligible employees who were notified that their current salaries were below their new pay grade minimums. The increase, which would be effective June 14 and appear in July 5 paychecks, would bring these employees to the identified market minimum salary. Below you will find more information to help you understand the project and how it will affect you. We are excited about how the changes will help us attract and retain great talent at UCF. If you have further questions about the project, contact the Human Resources Compensation team at compproject@ucf.edu.